Temporary stands will occupy the space where the football field is. The press rooms will be behind those stands at the Georgia Dome. It's almost time for spring training and selection Sunday is only about two weeks away, which means March Madness can't be far behind. While my Orioles are trying to craft a bullpen in Ft. Lauderdale (hey, everybody has a chance when it's spring), I'm spending my time preparing for one of the biggest events Sports Illustrated covers. Which also means it's time for me to share my annual update on what you need to know to make your coverage of the NCAA Tournament go as smoothly as possible. Let's deal with Atlanta first. 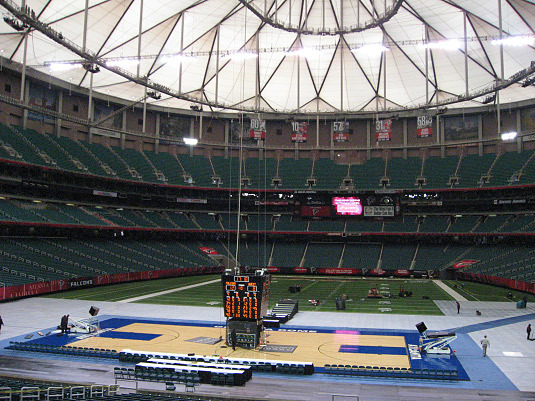 The Georgia Dome will host its second Final Four on March 31 and April 2. The first game on Saturday starts shortly after 6pm (ET) and the second game 40-minutes after the end of the first. Monday night's championship game is set to tip-off at 9:21pm (ET). It will be the third Final Four for Atlanta, which also hosted in 1977 at the old Omni when Marquette won the championship over North Carolina. Representatives from eight agencies met last Nov. 6 with the NCAA and Dome staff to discuss the working areas for photographers and many of our needs, especially in our workroom. That workroom will be located directly behind the temporary stands on the west side, approximately where it was in 2002. While the good news is that we're very close to the court, you'll also have to deal with the arena noise, since we're back out in the open this year with about 53,000 fans. But they're yelling away from us! * Like last year, photographer's use of wireless transmitting to download from the cameras will be restricted (hard wire it or pick up the cards). * All remotes must be in place by Thursday this year. The strobe lighting test has moved up to Thursday at 4 pm, so the NCAA will make a preliminary inspection of the remotes at the same time. They don't have to be working-just in place. * All upper remotes must in and working before the doors open for Friday's public practices. And the cameras and their clamps must be secured with safety cables. We'll try and find some time after the doors close Friday to adjust over the court remotes, if needed. * The remotes under the press table will once again poke through the fabric that hangs from the front of the tables. Please don't cut through it before asking-we're going to try and make it a little nicer looking. * It would help if you could label either the back of your camera, or the floor plates or clamp, so if something needs to be adjusted you can be found quickly. If you plan to install remotes at the first and second round and regional sites, remember you'll need the permission of the media coordinator. When you know where you're going, contact the media coordinator at that site, requesting permission to install remotes in approved places. Every year, there is at least one misunderstanding about the strobe rules when it comes to host cities. If you are in a city that's hosting the tournament, and you have strobes installed in the arena, please be aware you will have to pool the lights during the tournament if you choose to use them. They won't be available to you exclusively and under the tournament strobe polices, you can charge a reasonable fee for rental and upkeep. If you would like to install a pool set at any of the first or second round or regional sites, please drop me an email at porter_binks@simail.com. In Atlanta, there will also be a pool set that needs to be requested in advance. Deadlines: For host sites newspapers/agencies who wish to provide pool sets, I need to know by Monday, March 5th. This includes wire service photographers. If you simply want to participate in the strobe pool (rather than install a set), I need to know by Monday, March 12th, the day after Selection Sunday. For the regional sites, I need to know by Monday March 19th, the day we know who advances. For those who need phone lines, you can use this form to order: http://www.sportssystems.com/ncaa/ncaacommunications.pdf. This form should also appear at the bottom of the email you'll get from the NCAA sites approving your credentials. All credentials are handled on-line and while the men's & women's Final Four is closed, the other rounds are open. The site is available at http://www.ncaa.org, in the pressroom, under the media and events section. As always, I'm happy to help answer your questions, clarify what I can and hear any ideas you think would make the workrooms and other photo policies better.